Written by John Barrott. Published in Jaguar Enthusiast, vol 22 no 12, Dec 2006, The Jaguar Enthusiasts' Club. In the late summer of 2004 I realised that it had been a decade since the completion of the restoration of my Series 1 4.2 litre E-Type, DUD 555C (or DUD for short). In the time since its restoration I had shown it (with varying success), driven it as a daily road car through most summers, thrashed it on a couple of private speed events and taken part in a number of classic runs and rallies of varying competitiveness. In all putting on about 25,000 miles. What next? I was intending to spend the winter going through the car thoroughly to see how the restoration had held up over ten years. I hadn't been able to afford to do it to my total satisfaction at the time so it seemed a good opportunity to make any tweaks or modifications needed for the next phase of the car's life, yet to be decided upon. Racing was out because I didn't want to modify the car too much and hence compromise its road car qualities. Neither did I want to prang the car or do anything silly (in my 40s I'm not as quick mentally as perhaps in my 20s). Having read a copy of Circuit Driver magazine I suddenly realised that track days were not just the domain of preseason race testing and special days for one-make car clubs. There was a rapid growth in third-party organised track days and I found 60+ dates listed; I had found the next phase of my E-type enjoyment. I did a bit of internet research and I selected Bookatrack as the organiser to use for my first track days. They seemed professional, competent and well disciplined. This is important because your well-being and that of your car at these events has a lot to do with the way they are policed and run by the organisers. Booking and payment was also straightforward via their excellent website. I'm happy to report that all my first impressions were borne out in reality when I attended the events. 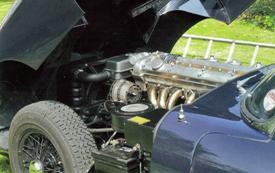 I set about going through the E-type with a fine-tooth comb over the winter of 2004. I didn't do any uncompromising track-based modifications because I wanted to retain it as a road car but I did fit a full Sabelt harness (removable), a fire-extinguisher and a straight through exhaust centre box and stainless manifolds, the latter only because the old ones had been damaged slightly when I'd 'grounded' the car years earlier. I also fitted the standard triple SUs with trumpets and Pipercross filter mitts and, after some experimentation, richer needles. 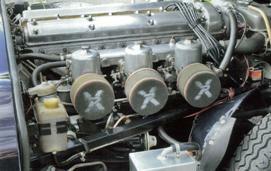 In fact the induction-side set-up ended up exactly the same as described in the Jaguar factory E-type tuning manual. The car already had a Kenlowe electric fan and Lumenition Optronic ignition fitted (more about that later) and I also checked out all the mechanical aspects of the car very carefully, replacing a few steering and suspension bushes as required. I spent some time thinking about the wheels. I'd always been a little worried about the strength of the standard wires, especially given the torque which the back wheels have to transmit when really pressing on (my car has a 3.31:1 rear axle). 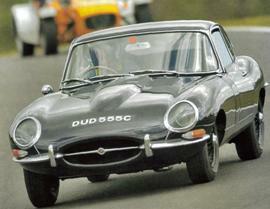 It also struck me that no-one had ever raced (to my knowledge) an E-type wearing standard wire-wheels. At first I looked at some great-looking knock-off Minilite alloy replicas but the offsets weren't quite right and they just didn't allow enough clearance in the rear arches. In the end I bought some triple-laced 5.5J racing wire wheels from Motor Wheel Services and had them enamelled in 'blue anthracite', which actually turned out to be virtually the same as the car's body colour of Jaguar dark blue. It is interesting to me that the appearance of the car with these wheels does tend to polarise opinions. I think they look fantastic, somewhat understated and invoking memories of the C-types with body-coloured wire wheels. Half of the people who look at them, though, don't like them at all. I did some research on tyres. Much advice surrounded moving to wider and lower profile rubber, but I didn't want to alter the car's appearance. Other advice implied that it would be better (and probably more fun) to stick with the standard tyre sizes unless I was going to modify the suspension (which I wasn't). I had been running on Avon Turbosteels for years and had been reasonably happy but in the end decided to fit the new wheels with a set of Michelin XVS 185HR15s. These are an evolution of the XAS tyres which were considered to be a period tweak when they first appeared in 1965, being the very first production asymmetric tread road tyre. I must say that despite being expensive, they have been a revelation compared to the Avons, exhibiting very good grip and handling progression, especially in the wet. The only other modification I did under the bonnet was to fit an oil catch tank. Not necessary for non-racing track days but there was now a large space left where the original air filter and intake box had been and the removal of these meant that I needed to tidy up the breather arrangements anyway. I must admit that at the back of my mind was also the thought of a marauding hoard of Caterham drivers bearing down on the owner of the E-type which had just blown up on the track and deposited a gallon of oil at the hairpin or wherever. At least a catch tank might help to avoid this situation. Inside the car I fitted some over-centre catches to the hinged console armrest cover and also to the luggage compartment dividing flap behind the seats. Being able to fix these firmly shut has the advantage that it is possible to retain some valuable items inside the car while on the track (the last thing you need when driving hard is for the arm rest to open and a wallet or mobile phone to escape and start flying about). I also constructed a video camera bracket and fitted this to the passenger's top seat-belt mounting. This actually proved to be an excellent spot from which to capture some in-car footage (some of which can be viewed on the Bookatrack web site). I bought myself a new helmet and some gloves from Demon Tweeks and that was it. Myself and DUD were ready for our first track day. The first booking that I made with Bookatrack was for a split-session track day at Cadwell Park in May 2005. 'Split-session' refers to the fact that drivers of novice, intermediate or advanced ability are sent out in separate sessions. The alternative is an 'open pit lane' event where, subject to a maximum number on track, anyone can go out at any time. I arrived at about 8am and the weather looked good, the sun warming the paddock as I emptied my tools and other removable contents of the car onto a tarpaulin, wrapped them up (using the spare wheel on top to keep everything together), locked down all the internals and gave the car a thorough check-over. I was intending to experiment with tyre pressures throughout the day and started off by putting an extra 4PSI in each (making 36PSI all round, cold). Although there were quite a few interesting cars in the paddock, I was attracting some attention, quite flattering. Everyone from the organisers down to the drivers both advanced and novice made a great fuss of me. Its not every day that you see an E-type at an event like that. My car was the oldest that day and also the slowest by quite a margin. I guess that my natural sense of preservation (for myself and the car) meant that I was driving at only 8.5 or 9 tenths, whereas some of the track specials were on the limit most of the time, but it also has to be admitted that Cadwell is really not the ideal track for an E-type. It flowed well enough and was good fun but the ratio of wiggly bits to straight bits is a bit high for a heavy, classic sports car. I went out in the morning novice sessions and had a fantastic time driving the circuit at which I had spectated so many times. The Mountain was particularly good fun although there was no way I could get the car airborne at the top like some others on the day! Most of a lap was taken in either second or third gear with only a couple of spells in top and I found that I was unable to get much above 100mph anywhere due to a frustrating misfire which was also manifesting itself occasionally at close to full revs in the other gears. In the afternoon, the day reverted to 'open pit lane'. This is a little more daunting for the less experienced but is made easier by the excellent way in which Bookatrack set the rules and police them. I can honestly say that there was no hooligan behaviour at all. Now this is when one aspect of track days really comes into its own. It is possible to try something out, do a few laps, make changes as necessary and go out again in an environment where a true and consistent comparison can be made. The intermittent misfire at high-revs had been something that I had been trying to track down for years. I had been through the whole of the induction, carburation and ignition system several times but had never completely eradicated it. Now I was becoming convinced that it was a low tension ignition problem. Because I could consistently provoke it on the track, I had the cause nailed by the end of the day. I also did a few experiments with tyre pressures and it was noticeable how these had an effect on handling. After trying various differential pressures front and rear I decided that my original settings of +4 PSI all round worked best at Cadwell given the conditions and the way I was driving. At the fast right-hander at Charlies following a bit of initial oversteer, all four tyres were just starting to let go together. In all I completed about 30 laps. Certainly everything was becoming quite warm at the end of a 5 or 6 lap session. The brakes noticeably smelling 'hot' with a lot of dust evident on my nice new wheels and the gearbox breather pumping out a little oil mist. all that time in second and third at full revs had given the gearbox a lot of work to do. I had also used up quite a bit of time when stopping and restarting while trying out some changes and diagnosing the intermittent misfire. Overall I was delighted with the way the car went and thoroughly enjoyed the whole experience. I thus booked another day, this time at Donington Park, an altogether more 'sweeping circuit' which I thought would be more suitable for the E-type. The intermittent misfire had, in fact, proved to be due to a faulty electronic module in the Lumenition system. Without the sustained high revs used at Cadwell Park I think I would still have been trying to diagnose it today. Although first thing the weather looked promising, It turned out wet but not just wet, a continual heavy downpour with the track often becoming flooded in some places. Boy, was I glad that I'd arrived early and nabbed one of the free garages! GTD40s are top-quality Ford GT40replicas. They were being tested by three 'proper' racing drivers, one of whom had flown over from the USA. I had met them the night before at the B&B that I was staying at so had already got to know them a little and now, having these guys next door really made the day for me. One of the day's highlights was when Malcolm MacAdam took me out for 6 laps in his GTD40. In the wet this was quite an experience and it certainly brought it home to me just how much more fearless and quick-reacting are drivers who have had some real competition experience. How Malcolm kept that car on the track I will never know. One thing is for certain, once we left the pit lane the wheels never actually pointed in the direction we were travelling until we re-entered the pits five laps later. That passenger ride remains one of the most remarkable experiences of my entire life. Once out on-track in the E-type my initial disappointment in the weather soon cleared. One of the first out and it soon became apparent that I was having fewer difficulties than some of the other cars. In my FHC with wipers going and the demister on I felt rather fortunate compared to the poor souls out in their open track day specials. I also realised that it was possible to have a great deal of fun in the wet because the car exhibited its edge-of-adhesion behaviour at significantly lower speeds than would have been the case in the dry. The Michelin XVSs are wonderful in the wet. I could easily provoke some opposite lock on any corner I wanted but the car never 'snapped' and would pull back in line when required either through steering or throttle inputs. All this, of course, at ridiculously slow speeds given the state of the track and my comparatively 'skinny' tyres. And yet, in a straight line, the Michelin's water-shifting properties meant that I seemed to have well above average grip when braking. I found that I could safely out-brake some much lighter cars. On one memorable occasion I had just let a Caterham past on the outside approaching the chicane. He braked just in front of me and immediately spun through 180 degrees and flew straight off into the tyres. I was able to brake later and easily get round. The other great thing about the wet from my perspective was that the wear and tear on the car seemed to be much less. I ended up doing about 40 laps and enjoying myself immensely. 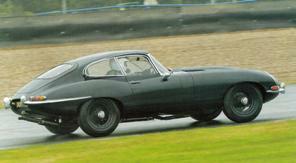 So, two track days later and it was tempting to start thinking about how the E-type's performance could be improved. On balance though, I have decided to do nothing to it other than fit some Greenstuff brake pads for this summer. The car goes really well now, still looks terrific and remains an excellent road car. So DUD will retain the same specification for the forseeable future and will continue to take part in track days as the 'Grandad of the paddock'. Over the next few summers my intention is to try and drive all the circuits at which I have enjoyed watching historic events over the years and build up a perspective of what its like on the other side of the tyre-walls. I can genuinely recommend entering your older classic Jaguar (or even your modern one) for a track day, and I can certainly also recommend Bookatrack as an event organiser. Track days are fantastic fun, the other drivers and the organisers are a friendly bunch and, as many said to me, there aren't enough interesting old cars taking part. Oh yes and don't forget the excellent track days organised by Terry Dye on behalf of our Club.